Description: 31T rolls north at Hop Bottom behind an NS leader, not the usual power for this train. He'll meet 30T here. Description: C44-9W # 2652 passes thru Jasper with a eb train. Description: CN 2652 9-44CW CN MacMillan Yard Apr 7 2007 Got a little toasty under the hood again ! 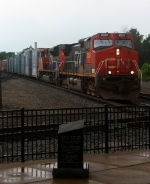 Description: a CN westbound rolls through Durand. 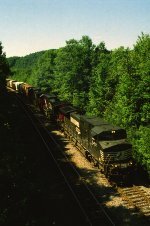 Description: CN 149 heads west through Durand. Description: Two Dash 9's bring the WC Transfer into New Brighton after A405 died out on the Minneapolis Sub. Description: The WC Transfer heads down Shoreham Hill. Description: Its 7:30 in the morning, and the WC is getting ready to start the days work as the sun trys to break through some clouds. Description: IC SD70 1031 is found on A431 today. Description: NB CN train A431.